It's summertime! Located near my airbnb in Ebisu, I saw many locals queuing up for this and I knew I had to make a stop to try this out. Famed for its ice-cream and kakigori (Japanese styled shaved ice), and just nice that it was summer, I have seen queues for this every time I walked by. Freezer bags can be purchased to 'buy' back tubs of ice-cream, if you don't want to have them immediately. Here are the sizes for the ice-cream. Starting from small sized ones, prices range from 400yen to 1,280yen. The place is extremely small. But somehow, it seems that the locals are used to the space constraints already. Some were even eating near the tea counter, where you can pour yourself a nice cup of hojicha. We went with the small size ice-cream combi, which was good enough for both of us. It came with a wafer biscuit and also some dried seaweed on the side. You're supposed to eat the ice-cream with the salted seaweed, and my friend was thinking it was strange until she actually tried it. 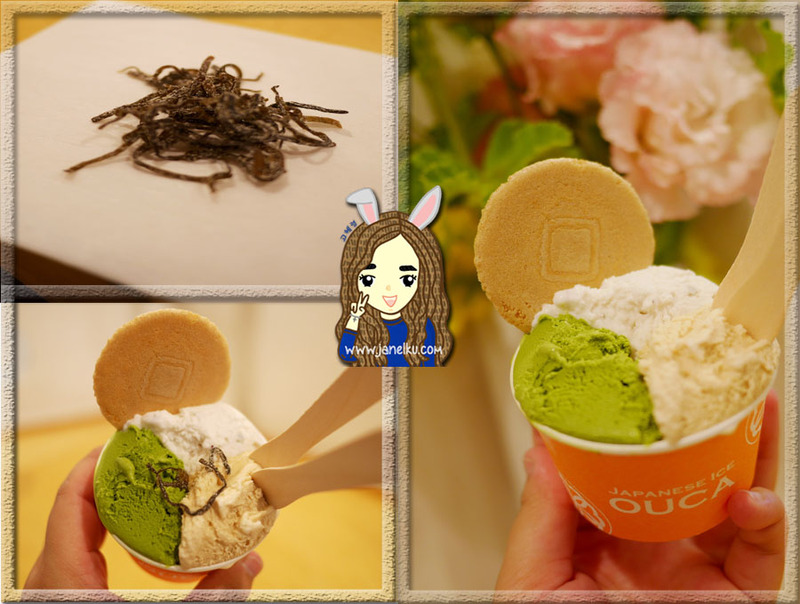 The overall combination was good and the ice cream was deliciously smooth! Here's our shaved ice (640yen, shirokuma)! For the summer, they have 4 types of shaved ice available. I asked the counter lady which one was the least sweet, as I don't really like extremely sweet desserts, which was what the Japanese seem to have a liking for. But she told me every thing is quite sweet, so I just ordered something which seemed like it could be the 'least sweet'. Our shaved ice came in a cute polar bear shape, and I snagged a solo shaved ice shot and put myself in great risk of getting captured in another group's wefie shot. We thought that the ears were mandarin orange, but it turned out to be peach. LOL. The shaved ice was quite fine, but not as fine as Korean bingsu. We also got their matcha ice shake (520yen), which was also one of the most popular summer drink in their shop. Matcha in Japan never seems to go wrong. Overall, we loved it, despite all its sweetness. Japan's big on recycling, and doing it well. Hence, don't forget to throw your straws and cups in the right bin!